Global Vaccines Market size is set to exceed USD 70 billion by 2025; according to a new research report by Global Market Insights, Inc.
Introduction of innovative technologies in vaccination, rising government support for product development will stimulate global vaccines market growth over the coming years. Growing awareness towards preventive vaccination in pediatric and increasing adoption of therapeutic vaccines in cancer treatment will fuel industry growth. Increasing disease prevalence in underdeveloped countries coupled with growing incidence of cancer & HIV will serve as high impact rendering factor for the business growth. High cost and inadequate reimbursement coverage for vaccines will hamper industry expansion. Moreover, stringent government regulations for product approval will further restrain business growth. Pediatric segment will witness 9.1% CAGR during the forecast timeframe owing to CDC recommendation for immunization schedule to protect children and infants before getting exposed to potentially life-threatening diseases. 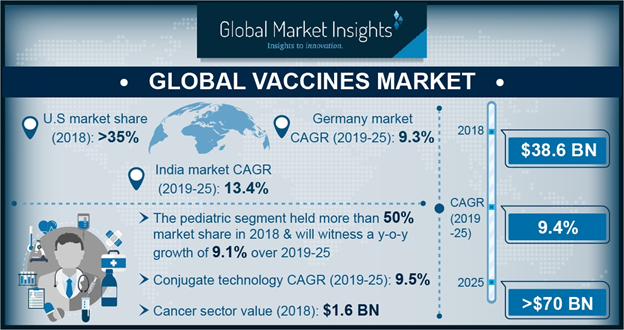 Attenuated vaccines technology segment accounted for more than 20% market share in 2018 and is estimated to grow significantly over the coming years due to factors such as robust antibody and cellular responses, and frequently deliberate lifelong immunity with only one or two doses. Influenza disease segment will witness considerable growth to reach USD 6.1 billion by 2025 due to growing incidence, mounting number of disease-causing microbes (pathogens) and rising awareness in emerging economies towards disease prevention. Availability of vaccines at affordable prices in hospitals and clinics will augment the segment growth. U.S. market dominated industry in 2018 by accounting for over 35% market share of global market owing to enormous impact of immunization on improving health of children and protecting them with vaccines due to epidemics of preventable diseases like mumps, pertussis, and measles. India will witness 13.4% CAGR during the forecast period due to improved efficiency of immunization programs and technological advancements in vaccine storage and transport. Rising per capita income, improved healthcare infrastructure and growing healthcare expenditure will promote business growth. China market will grow at a substantial rate owing to rising disposable income, rapid economic growth, rising number of unvaccinated migrant workers, and delivery of efficient healthcare services. Brazil vaccines market will grow due to availability of vaccines at low cost and rising initiatives by Brazilian government to improve vaccination coverage will stimulate steady business expansion. Some of the companies operating in industry are Abbott, AstraZeneca, Astellas Pharma, Bristol-Myers Squibb, CSL, Emergent BioSolutions, GlaxoSmithKline, Johnson & Johnson, Merck, Novartis, Novavax, Pfizer and Sanofi Pasteur. New product launches and expansion of existing product portfolio will mainly drive the business growth. Major industry participants will endeavor to fortify their market position by adopting these strategies.